by Turnbull, Ann A.; Turnbull, H. Rutherford; Wehmeyer, Michael L.; Shogren, Karrie A. 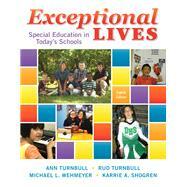 Note: This is the loose-leaf version of Exceptional Lives and does not include access to the Enhanced Pearson eText. To order the Enhanced Pearson eText packaged with the loose-leaf version, use ISBN 013358934X. Exceptional Lives: Special Education in Today's Schools pairs real-life stories about children, their families, and their educators with the most recent evidence-based research on inclusion of students with disabilities in the least restrictive environment. Updated real-world vignettes, first-person My Voice features, and new videos immerse readers in the lives of exceptional individuals. With its focus on real students, stories, and solutions, Exceptional Lives gives readers a comprehensive view of the rewards, challenges, and triumphs involved in special education today. The Enhanced Pearson eText features embedded video, assessments, and Pearson’s eLearning Modules. Ann Turnbull has been a professor, teacher, researcher, and advocate for individuals with disabilities, their families, and service providers for 4 decades. She is currently the Ross and Marianna Beach Distinguished Professor of Special Education and Co-director of the Beach Center on Disability at the University of Kansas. In 1988, Ann was the co-founder of the Beach Center on Disability which is a vital hub of national and international research and development on contemporary issues impacting the quality of life for individuals with disabilities and their families. In 1999, she was selected by 7 professional and family organizations as one of 36 individuals who “changed the course of history for individuals with intellectual disabilities in the 20th century.” Ann has provided leadership in national professional and family organizations, including being the President of the American Association on Intellectual Disabilities. She was selected in 1990 for the Rose Fitzgerald Kennedy International Leadership Award, as well as for The Arc’s Distinguished Research Award in 2004. In addition to her professional credentials, she is the parent of three children, one of whom, Jay (1967-2009), was an adult son with multiple disabilities who had what Ann describes as an "enviable life" in terms of his inclusion; productivity; and contributions to his family, friends, and community. Rud Turnbull III, a self-described student of the human condition in a disability policy context, is a researcher, teacher, consultant, and advocate in the field of developmental disabilities. With his wife Ann, he is co-founder and co-director of the Beach Center on Disabilities. He is a Distinguished Professor, in special education, and is also Professor of Law at the University of Kansas Law School. His research has addressed nearly 20 different issues of disability policy and has qualified him to be an expert witness before Congressional committees and draftsman of state and federal statutes, regulations, and proclamations. He has served as chairman of the board of trustees of the Judge David L. Bazelon Center for Mental Health Law; president, American Association on Intellectual and Developmental Disability; chairman, American Bar Association Commission on Disability Law; secretary, The Arc of the United States; and treasurer, The Association for Persons with Severe Disabilities. He has received peer recognition as one of 36 people who, in the 20th Century, “changed the course of history in mental retardation”. He is a graduate of Kent School, Kent, CT; Johns Hopkins University; University of Maryland Law School; and Harvard Law School (post-graduate degree). Michael L. Wehmeyer, is Professor of Special Education; Director, Kansas University Center on Developmental Disabilities; and Senior Scientist and Co-Director, Beach Center on Disability, all at the University of Kansas. Dr. Wehmeyer has directed externally funded projects totaling almost $30 million conducting research and model development activities and personnel and leadership preparation activities pertaining to the education and support of youth and adults with intellectual and developmental disabilities. He is the author or co-author of over 300 peer-reviewed journal articles or book chapters and has authored, co-authored, edited, or co-edited 32 books on disability and education related issues. Dr. Wehmeyer is Past-President of the Board of Directors for and a Fellow of the American Association on Intellectual and Developmental Disabilities (AAIDD); a past president of the Council for Exceptional Children’s Division on Career Development and Transition (DCDT); a Fellow of the American Psychological Association (APA), Intellectual and Developmental Disabilities Division (Div. 33); and Vice-President for the Americas and a Fellow of the International Association for the Scientific Study of Intellectual and Developmental Disabilities (IASSIDD). In 2013, Dr. Wehmeyer was awarded the Distinguished Researcher Award for lifetime contributions to research in intellectual disability by The Arc of the United States. Karrie A. Shogren, is an Associate Professor in the Department of Special Education. Dr. Shogren's research focuses on self-determination and systems of support for students with disabilities and she has a specific interest in the multiple, nested contextual factors that impact student outcomes. Dr. Shogren has published over 50 articles in peer-reviewed journals, is the author or co-author of 5 books, and is one of the co-authors of Intellectual Disability: Definition, Classification, and Systems of Support, the 11th Edition of the American Association on Intellectual and Developmental Disabilities' seminal definition of intellectual disability (formerly mental retardation). Dr. Shogren has received grant funding from several sources, including the Institute of Education Sciences (IES). Dr. Shogren is co-Editor of Inclusion (with Michael L. Wehmeyer, Ph.D.), a new e-journal published by the American Association on Intellectual and Developmental Disabilities, and is an Associate Editor for Remedial and Special Education and Intellectual and Developmental Disabilities.